Corrida at the Plaza de Toros de Las Ventas in Madrid brings the essence of Spanish tradition. A massive 65 meter diameter arena makes it one of the largest sites of that kind in the world. It has a simple design. Sandy area with a well-marked range, a secure hideout for toreador and a substantial stand for audience. The show starts. As a rule it usually lasts six rounds. It is a deep-rooted Spanish tradition. The long before unchanged course of the show lets you understand its essence. 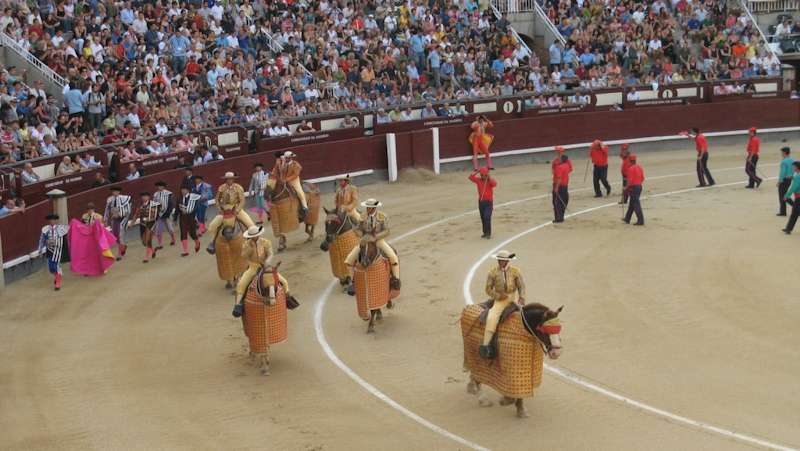 Corrida is about bulls being killed by toreadors in an exactly planned fashion. After the introduction of participants, the first one to appear at the stage is capeador. He is responsible to infuriate a bull using pink sheets. Straddled a leather coat covered horse picador takes over from here. He weakens with a spear an already enraged bull. In one of the rounds I see a bull charging to hit a horse with a force that knocks out the horse to the ground. Banderillero, the next one, has a difficult task. He has to deal with an already angry bull and avoiding being hit try to plunge two short sticks into bull’s back. The last one is matador. It’s also a crucial part of a whole spectacle. Matador brings in a bull’s ultimate anger with his red muleta. 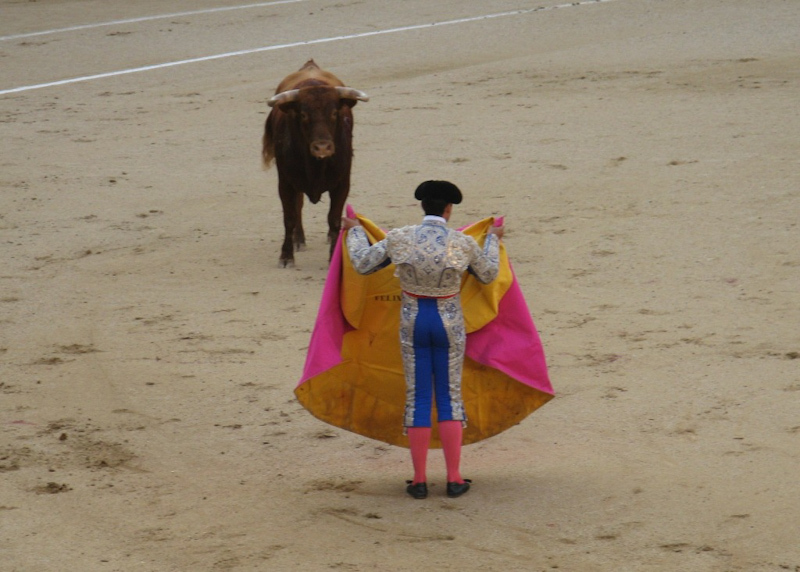 Matador tries to trick the animal dodging from one side to the other. He is waiting for the right moment to drive his sword into the animal’s nape of the neck. This is expected by the audience to be a fatal blow that knocks out a massive beasts to the ground. A slaughtered bull is harnessed and pulled by two horses away from the arena. That is how six bulls are killed during toaday’s show.